There’s nothing I enjoy more than the sizzle of a sausage on the grill in the summer – and it seems I’m not the only one. Statistics show that 15.62 million Americans each consumed five pounds of sausage or more in 2018! Historians can trace the origin of the sausage back to ancient Babylon and Greece. Much in the same way we enjoy hot dogs at a baseball game, Ancient Greeks bought sausages when going to the theater from vendors in the aisles. Coming from the Latin salsus, meaning salted, sausage making was a way of preserving meats in drier climates. Modern sausage making now involves fresh ingredients and additives for flavoring. But do you really know what’s gone into those sausages you just bought? In this article, we’ll take a look at a piece of equipment which can help you make your own sausages at home—the sausage stuffer. We consider what to look for in the top models, and recommend some of the best sausage stuffers available in 2019. The device commonly known as a sausage stuffer is designed to help pack, or stuff, your sausage meat into casings. It can take much of the hard work out of making your own sausages, with results comparable to commercially available products. Available in both electrical or manual versions, a cylinder or hopper is used to store the meat, with a piston to push it out. The meats and other ingredients are forced through a tube, which tightly packs it into the casing. 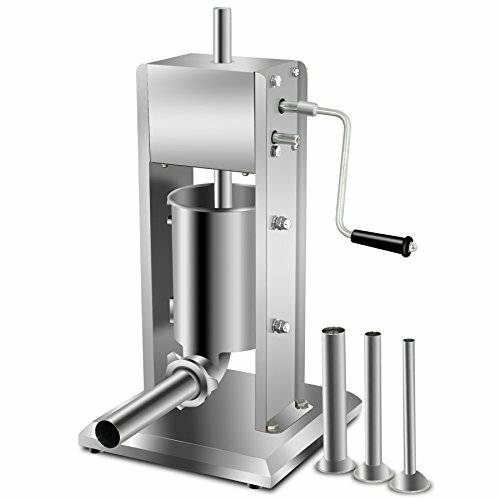 A sausage stuffer provides a fast, efficient, and hygienic way of producing your own sausages. You can control the amount of salt, spices, and even the gluten content that goes into them. You can also produce the exact amount of sausages you need. When looking for the best sausage stuffer, you’ll find that there are many types available. Some models are fancier than others, but they all basically do the same thing. Let’s take a quick look at the different types available. While many experienced sausage makers prefer vertical stuffers, there are now many beginner models available too. A larger capacity makes them similar to commercial sausage-stuffing machines, and they come in a choice of manual or electric. A large piston-like cylinder holds the seasoned ground meat, which is extruded through a tube at the base. An easy-to-crank handle or motor pushes the meat down, with the pressure applied from the top – meaning it doesn’t have to hang over a counter edge. The difference in the capacities of these devices will vary depending on the means of power. 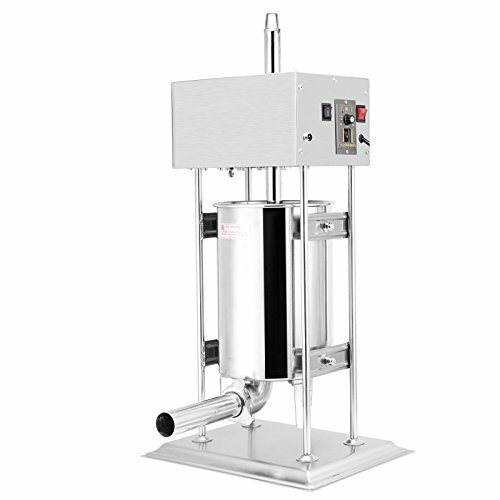 Electric vertical sausage stuffers will typically produce much larger quantities – often 15 pounds or more in one go. Manually operated machines will typically produce smaller quantities in one go, with a capacity of 5–10 pounds of meat. 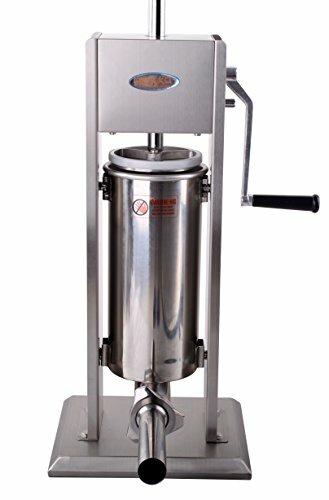 Horizontal sausage stuffers use a piston-like cylinder, similar to vertical stuffers, which lay flat on the countertop rather than upright. The cylinder can be easier to load than a top-loading tube, but you will need more counter space to operate one. With the handle often longer than the cylinder, you will need the sausage stuffer to overhang the edge of your counter for a full rotation. The base of the unit will require clamping or bolting down for stability, and you may need something to catch the sausages as they are pushed out. Due to the horizontal alignment of the cylinder, the capacity of these stuffers can be quite large, often up to 20 pounds. For the larger capacities, you will definitely want to consider an electric model, with gears and variable speeds that will make it more comfortable to operate. Manual machines tend to be less expensive and take up less space than a similar electric model. This makes them easier to store between use, easier to make room for during use, and not limited to being used near a power outlet, so they are more flexible and accommodating. If you’re only going to be producing smaller amounts of sausages for you and your family, a manual model will suffice. However, a manual sausage stuffer does rely on your muscle power to force the meat out, mainly assisting with the shaping of sausages. And there may come a time when you want to produce larger quantities for your friends, or even start a small sausage-making business. Electric sausage makers can feature much larger capacities, and some will even have grinders built in. An electric stuffer will process larger batches much quicker and leave your muscles rested, for picking up those extra hot dogs. Side note: If you haven’t already got one, you can check out our guide to the best meat grinders. When shopping for a sausage stuffer, there’s a few key features and factors you will want to look for, to make sure you get the best one for you. Let’s take a look now at how you should go about shortlisting from the many hundreds of models available. Electric or manual, horizontal or vertical, or even an attachment for your food processor, there are many options. Although kitchen machine attachments are fine for occasional light use, we’re going to look here at more dedicated machines. Horizontal or vertical orientation mainly comes down to personal preference—with many people finding a vertical stuffer easier to use. Space in your kitchen is another consideration. Vertical machines can often be too tall to store under countertop units or in kitchen cabinets. Manual or electric can depend on how strong you’re feeling. For larger quantities of sausages on a more regular basis, you will benefit from the advantages of an electric motor. Unfortunately, they can be more difficult to learn to use, and the need for power limits where you can use them. Sausage stuffers will generally be listed by their cylinder capacity or the amount of meat they can store, in liters or pounds. This will affect how many you can produce and how quickly. A larger capacity cylinder enables you to process more meat in fewer steps and speeds up the sausage making as well. Once your meat has been removed from a refrigerator and mixed, it becomes susceptible to bacterial contamination, so time is important. You should also consider the stuffing tubes provided with your sausage stuffer. Most models will come with two to three tubes, allowing you to vary the size of sausages you produce. Most commonly, these tubes are half-inch, three-quarter-inch, or one-inch diameters, although they can also go up to two inches. Regular sausages, like breakfast links or pepperonis, will need a smaller casing of half an inch, while summer sausages or bratwursts may need an inch or more. The more stuffing tubes your machine has, the more versatility it will offer out of the box. When choosing a sausage stuffer, It’s important to make sure that the body is constructed of a material that won’t be difficult to clean. A stainless steel exterior and interior will provide surfaces that the meat won’t stick to. It will also be more durable and less likely to rust – extremely important where food preparation is involved. Preferably, the gears and any moving parts should be made of a durable metal that won’t wear down too easily. There are machines with plastic gears, but they’re likely to wear down or break easily and halt your sausage making until the replacement part arrives. The handle of the crank on a manual machine should be sturdy enough to withstand the torque it will endure. A polycarbonate handle can be more comfortable to hold, but should be secured to a solid metal shaft for extra durability. Just like the main body construction, you will want a base which is both solid and stable. The heavier, the better. The machine is likely to move about a lot when in use, and you don’t want to end up with sausages or casings all over the floor. Horizontal machines will normally use a clamping system to overhang the counter. Both vertical and electrical sausage stuffers tend to have a heavier base to keep them sturdy. If your machine doesn’t come with a clamp, it may be worth investing in some. 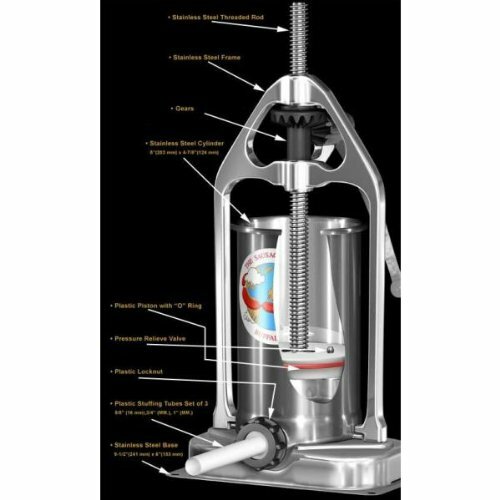 An air valve on the sausage stuffer will help to get rid of any air trapped inside the ground meat. Making sure there is no air will prevent it being pushed through into the casing, which can lead to it splitting. It’s always advisable to choose a sausage stuffer which has at least two speeds. As you get more experience, or if you have an extra pair of helping hands, you can then increase the speed to get the work done more quickly. Some casings you use, especially natural casings, may be weaker than others. If you run your stuffer at maximum speed, they could tear or rip. Having the ability to slow things down can really help here. The grind of the meat can also determine the speed required, with coarser grinds requiring a more gradual pressure, to avoid bursting the cases open. Sausage making can be quite difficult at times, and it does take practice to master. Manual machines will offer an easier learning curve, allowing you to progress at your own pace. As a rule, vertical sausage stuffers will be easier to use than horizontal ones. Many now feature removable or tilting cylinders for loading, which rivals a horizontal stuffer’s ease. To start, we’d recommend having an assistant to help when making your first sausages. One person could turn the crank or push the switch, while the other catches and links them once stuffed. Some electric stuffers use foot pedal attachments, which enable you to turn the motor on and off without letting go of your sausages. Always try to choose a sausage stuffer that can be easily taken apart for cleaning. If you can’t clean the stuffer properly, some meat may get stuck in a hard-to-reach part, causing an unpleasant odor or bacteria to grow. Although quite rare nowadays, sausages are the second biggest cause of botulism, originally known as the sausage disease. The ground, moist meat is the perfect environment for the growth of bacteria spores which can lead to foodborne illnesses. One of the things we’ve learned over the years is that kitchen appliances, especially those with moving parts, tend to break down. With heavy use, parts on your sausage stuffer, like the crank, gears, or even the clamping mechanism, may malfunction at some point. Most sausage stuffers will be covered by at least a one-year warranty from the manufacturer. Some more expensive electric models may offer a longer warranty on the electrical motor, or the option to extend. Electric machines may seem to offer more convenience, but do you really need the extra capacity and speed? Sometimes it would be better to spend a little more on a durable manual machine that will last you many years. Less expensive electric machines commonly feature weaker gears and plastic parts, which are more likely to break. A solid stainless steel manual sausage stuffer is easier to clean and could still look like new in a couple of years if properly maintained. A quality electric model can cost up to four or fives times the price of a similar capacity manual stuffer. If you intend to make sausages on a regular basis, however, or as a small commercial venture, it can soon pay for itself. The time you save will allow you to make many more delicious sausages. Taking into account what we’ve discussed above, let’s look at what we consider to be some of the best manual sausage stuffers available today. Ideal for those taking their first steps in sausage making, many gourmet chefs will argue that a manual stuffer is more authentic. If you thought that making sausages at home was going to be difficult, think again. The tilting cylinder with dual fill rate system of this Hakka vertical stuffer makes it easier than ever. The first thing you’ll notice with this sausage stuffer from Hakka is the solid, all-metal construction. All the parts are made from stainless steel—from the cylinder to the stuffing tubes, perfect for safe and sanitary meat processing. The tilting cylinder makes filling easy, yet locks securely into place, due to the redesigned steel frame. Less movement as you stuff the sausage makes for a more uniform filling of the cases. The cylinder can also be removed, which means cleaning it is a dream. Two manual speeds allow you to set your own pace—whether you’re a beginner who needs to take it slow or more experienced and want to steam ahead. Another great feature is the four nozzles which are provided for more versatility: these are also made of stainless steel. 5 inches by 11.4 inches by 22 inches. Stainless steel stuffing tubes in 67-inch, 0.63-inch, 1.25-inch, and 1.5-inch size. Air release valve included in the piston. Solid stainless steel construction won’t rust or corrode. 11-pound cylinder offers more space for larger batches of meat. Two-speed control for more efficient stuffing. Stainless steel piston with an air-release valve. Easy to clean with a removable cylinder. Pressure can cause the handle to swing back—no reverse lock. No clamps on the base. Plastic feet can mark countertops. Welded metal edges are sharp and can cut skin. 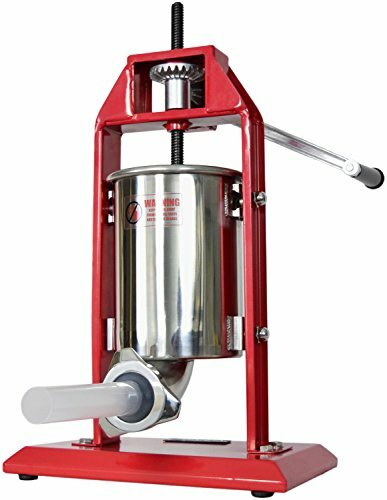 You’re going to have to look very hard to find a more durable and well-built manual meat stuffer than the Hakka Vertical Sausage Stuffer. The box-like design may not be the most elegant on the market, but it will last repeated uses. Designed for use by professionals and beginners alike, the Vivo Vertical Sausage Stuffer sports an all-metal frame. It can make quick work of a batch of kielbasa or bratwursts, with a large seven pounds of meat capacity. The Vivo’s cylinder and spout are constructed from stainless steel, with the gears and pistons made from a durable metal. This time it’s all about the design—with an attractive red finish and a more elegant shape. That doesn’t make it any less packed with features, with high-torque gears giving this stuffer an elite level of performance. An easy tilt-and-release design of the main cylinder allows for convenient meat filling. For faster filling and less waste from torn casings, the aluminum piston has an air-release valve to let trapped air escape. A rubber gasket around the outer edge of the piston stops the meat from seeping out. Did we mention how easy it is to clean? The whole unit disassembles in mere seconds, for easy cleaning and handy storage. At over 20 inches high, it’s not the sort of appliance you’d want to store on your countertop. 6 inches by 12.5 inches by 9.9 inches. Stainless steel cylinder and spout. Aluminum plunger and all-metal high torque gears. Metal piston with air release valve. 7-pound meat capacity in a removable and tilting cylinder. Certified to SGS food safety standards. Four plastic nozzles included: 0.4-inch, 0.79-inch, 1.18-inch, and 1.57-inch. This stuffer can handle both large and small batches. Casings can be filled very quickly. Air-release valve is a useful extra feature. Gasket on the piston ensures that the meat doesn’t come up or around the cylinder. Four different size filling tubes as standard. Tilting mechanism provides for faster refilling. Very easy to disassemble and clean. No base holes to keep the device permanently in place. Dead space in the bottom elbow of stuffing nozzle wastes meat. Plastic/nylon filling tubes. Burrs on the tubes can catch on casings. Too large to comfortably store on your kitchen worktops. If you’re looking for a durable yet stylish way of making sausages, you can’t go wrong with this vertical sausage stuffer from Vivo. All-metal gears with a high torque ensure it can quickly stuff your sausages with its large 7-pound capacity of meat. We’re not all blessed with being right-handed, some of us are special and use our left hands. This all-metal vertical sausage stuffer from Super Deal features a unique design which allows it to be used with either hand. Don’t get us wrong, the left-handed feature isn’t just a selling gimmick. This sturdy sausage stuffer features an all-metal construction that rivals many other vertical stuffers. A stainless steel body and all-metal gears and piston rod make it a durable, efficient sausage stuffer—just a bit more user friendly for left-handers. A removable cylinder holds a whopping 11 pounds of meat, with a locking nut on the nozzle preventing leakage. For easy filling, the cylinder can either be removed or tilted by 90 degrees. Provided with four stainless steel stuffing tubes, you should have enough versatility for a wide range of sausages—and the tubes will last longer too. Two manual speeds offer the option of going slow for new users, ready to crank it up as you get more experienced. A sturdy hand crank connects to all-metal gears and piston rod, to withstand greater pressure and offer more consistent results. 6 inches by 14.7 inches by 12 inches. All metal gears and piston rod. Four stainless steel stuffing tubes: 0.67-inch, 0.75-inch, 1.25-inch, and 1.5-inch. Stainless steel body can withstand greater pressure and won’t corrode or rust. All-metal gears and piston rods for more pressure to stuff casing. Four stainless steel stuffing tubes are more durable than plastic. Can be used by both right-handed and left-handed people. Additional parts can be difficult to obtain. Wasted meat in the elbow space of the stuffing nozzle. Very heavy and difficult to move on your own. Super Deal has made an extremely hardwearing sausage stuffer with this model, which could be just as at home in a commercial environment. And did I say you can use it if you’re left-handed too? Yes, well no other manufacturers seem to have made this effort, which could make it more attractive to a wider audience. What’s not to like about a product made by a company known as The Sausage Maker or TSM for short? Just like the company name, this product does exactly what it says on the box—makes sausages, and lots of them! This durable product from TSM has recently replaced the chrome-plated cast-iron frame with an all stainless steel construction. As a result, it’s much more lightweight, with a compact height of just 16 inches. Definitely one of the easier to store and move vertical sausage stuffers. A 304-grade stainless-steel cylinder holds five pounds of meat and is easy to remove for cleaning. A food-grade plastic plunger includes a heavy-duty, one-inch O-ring to prevent meat from seeping out of the top. A stainless steel safety valve is a useful addition, which prevents blowouts when stuffing. The Lubricomp? resin gear system is not as a rigid as stainless steel gears, with less friction for a smoother, effortless crank. The three stuffing tubes provided allow for a wide range of sausages. Unfortunately, they are made from plastic, which is unusual for this price. 5 inches by 6 inches by 16 inches. 304-grade stainless steel 18-gallon cylinder. Food-grade plastic piston with heavy-duty, Duro-Nitrile O-ring. Stainless steel pressure relief valve. Three plastic stuffing tubes: 0.63-inch, 0.75-inch, and 1-inch. 16-inch height is easier for shorter individuals to operate. Durable 304-grade stainless steel used for construction won’t rust or corrode. Pressure relief valve built into piston can avoid burst casings. Stainless steel base includes holes for attaching to a tabletop. Sturdy crank rod won’t break too easily. Lubricomp? resin gears require less effort to turn. Easy to clean or reload with the removable cylinder. Even the smallest tube provided, ?-inch, will be too large to use with sheep or slimmer collagen casings. The plastic piston may not be as durable or exert as much pressure as metal. Burrs on the plastic stuffing nozzles can sometimes catch and tear casings. If you don’t need to make a large quantity of sausages at a single time, this vertical sausage stuffer from TSM is ideal. The smoother resin gears and shorter height make it much easier to use by anybody, while still featuring the same durable stainless steel as larger models. 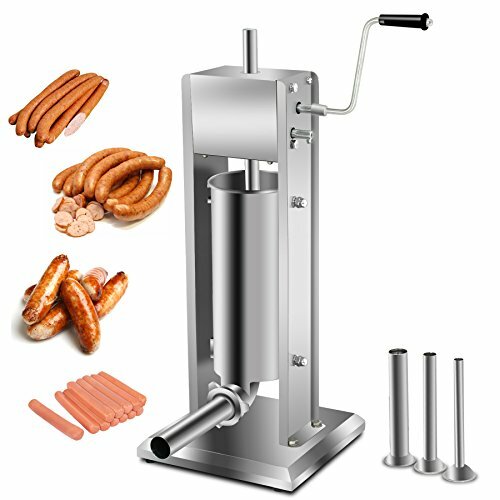 Maybe you were intrigued by the earlier left-handed vertical sausage stuffer from Super Deal, but you just don’t need a machine that big. This seven-pound dual-speed vertical stuffer is virtually the same model but in a four-inch shorter design. Bigger isn’t always better. This seven-pound capacity sausage stuffer shares everything we loved about its larger sibling, just with a smaller capacity. The solid stainless steel construction of the body and cylinder are the same, with durable all-metal gears and piston rod. The cylinder can still be easily removed for reloading or cleaning. The only difference is the slightly larger base, which makes this smaller unit even more stable on your countertop. 23 inches by 14 inches by 14 inches. Food contact areas meet SGS food hygiene standards. Heavy-duty stainless steel construction with all-metal gears. Removable cylinder for easy cleaning. The cylinder can tilt up to 90-degrees for reloading. Two-manual speeds to set your own pace. Larger base with rubber nozzles for extra stability. Very heavy for a smaller capacity stuffer. No air-release valve to cut wastage of burst casings. Meat can be difficult to push out of elbow space below the cylinder. If you’re one of the special few who is gifted with left-handedness, then the Super Deal Vertical Sausage stuffers are ideal. This more compact size is still heavy, and could be used in a commercial kitchen, but is compact enough for your home kitchen too. Using your left-handed mouse, click here for more details on this versatile vertical design sausage stuffer from Super Deal. The only horizontal manual sausage stuffer we have looked at is also the least expensive of those featured. But don’t let the low price tag put you off; this compact stuffer offers value for money in a unit which you could easily transport on those hunting trips. Fresh venison sausage, anyone? Made with both aluminum and plastic components, this compact stuffer is durable and easy to clean after use. Due to the relatively small capacity, this machine is better suited to domestic kitchens, rather than a commercial enterprise. The compact size and horizontal design make it easy to store away in a kitchen drawer, or throw in your backpack for camping adventures. A rubber suction cup on the base means it can stick to almost any surface: just make sure it’s smooth and non-porous. 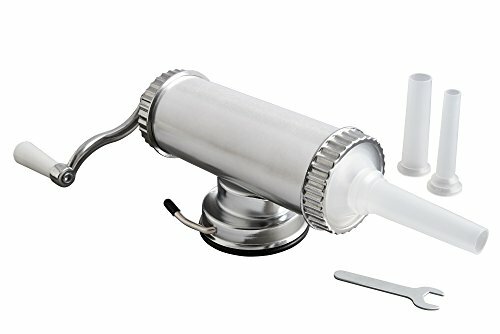 The Fantes stuffer is easy to use, with an operation similar to a manual meat grinder. The crank is at one end of the cylinder with the stuffing tubes at the other end. Simply hang the handle end over the edge of a table and turn it to stuff your sausage. Being a budget model, it doesn’t have any of the added features like air-release valves or multiple gears. The emphasis is on user-friendly operation and ease of assembly. Three provided plastic stuffing tubes offer versatility in the type of sausage you produce. 16 inches by 4 inches by 5 inches. 2 pounds of meat capacity. Three plastic nozzles included: 0.6-inch, 0.7-inch, and 0.9-inch. Durable construction with aluminum and plastic parts. Compact and lightweight—most portable stuffer we’ve featured. Easy to use, reload, and clean with fewer moving parts. Easily customizable with the three stuffing tubes provided. Disassembly and handwashing are simple. The suction cup on the base isn’t very strong and malfunctions easily. No air pressure release valve can cause the presence of air balloons in casings. Not suitable for heavy-duty sausage making. When that hunting mood takes you, and you want to throw a small sausage stuffer in your weekend pack, the Fantes is ideal. The aluminum construction is durable enough to last you many camping trips. Anywhere you have a flat surface could easily be turned into a small production facility. Maybe your arms are starting to look like Arnold Schwarzenegger’s, or perhaps more people are demanding your new tasty sausages. If you haven’t already started with an electric sausage stuffer, you’ll almost certainly be tempted to upgrade. LEM has certainly made a name for itself in the sausage-stuffer market. If you’re familiar with their very popular manual stuffers, this electric model will hold no surprises. It uses the same quality features, but includes a motor to reduce the effort you need to physically exert. Looking very much like any of the vertical sausage stuffers we’ve already seen. The vertical design will take up less space than a meat grinder/stuffer combo. Most of us already have other tools in the kitchen that can already grind or mix the meat, why have another device for the same job? A durable appliance, the LEM features a stainless steel construction and a removable cylinder for easier cleaning. The four stuffing tubes included as standard are made of the same sturdy stainless steel, and a clamp-free base keeps the machine stable. Where it differs from the previous vertical stuffers is the inclusion of a motor where the crank handle would normally be. With 15 watts of power, the manufacturer claims it could push out a ton of meat—fortunately you’re only needing to push about 20 pounds. It’s simple to use, with eight variable speeds and a foot switch for hands-free control. 39 inches by 18 inches by 15 inches. Stainless steel body and base. Removable cylinder holds 20 pounds of meat. 120-volt, 15-watt motor with an electric foot pedal. Variable speed control with eight speeds. Four stainless steel stuffing tubes: 0.5-inch, 0.63-inch, 1-inch, and 1.25-inch. All stainless-steel construction is easy to keep clean and won’t corrode. Removable cylinder for a more efficient cleaning. Solid base with rubber feet to keep machine stable. Foot pedal makes it easier to use unassisted. Handle included for cranking manually when stuffing smaller amounts. The plunger can take a lot of physical pressure to push down for initial loading. The motor may cut out with larger or thicker loads. Manual crank handle provided as back up is very short. This beast of a machine is literally a one-man army when it comes to making sausages. It boasts a large 20-pound capacity and the ability to be operated by one person—thanks to the powerful motor. 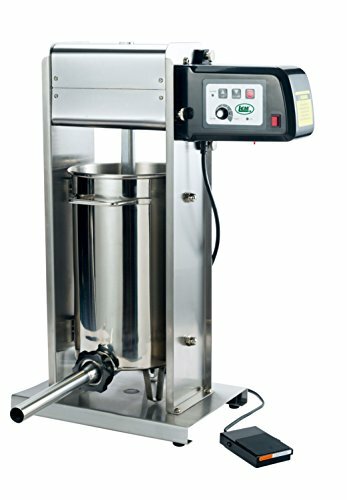 The LEM electrical vertical sausage stuffer could be the answer to your staffing issues if you run a small business. If you’re looking to make huge quantities of sausages, this electric stuffer from FoodKing offers several larger capacities. We’ve looked at the largest available, 33 pounds, and you will definitely want a motor for that much meat. Short of buying a combined grinder/stuffer, this is the closest you will get to the sausage stuffers you see in commercial plants or restaurants. The stainless-steel construction ensures it meets food hygiene standards even including food-safe, grade-304 stainless-steel stuffing tubes. Unlike the LEM vertical stuffer, this one features a motor built into the sturdy frame rather than just tacked on the side. Although it can’t be manually cranked, it does have a more powerful 25-watt motor, with high-torque gears for more pressure. The operation is simple, with the barrel easily removed for refilling with meat or cleaning when done. A foot pedal switch allows for hands-free operation of the variable speed motor. Controls on the side of the motor can be set by hand for the different speeds and the high-torque management system. 32 inches by 17 inches by 14 inches. Stainless steel stuffer body and cylinder. 33 pounds of meat capacity. 120-volt, 25-watt motor with an electric foot switch. Food grade piston with O-ring seal and air release valve. Variable speed and high-torque management system. Four 304-grade, stainless steel stuffer tubes: 0.7-inch, 1-inch, 1.5-inch, and 1.65-inch. Professional 304-grade stainless steel construction won’t corrode or rust. Huge capacity of 33 pounds. Cast aluminum plunger with an air-release valve. Large O-ring prevents meat from rising up the cylinder. Easier to transport with the motor built into the frame. Foot pedal activation system allows for single person use. Variable speeds and high-torque management system. Stainless steel tubes can often tear thinner casings. Very little weight in the base, causing the stuffer to wander as it’s used. The seal on the piston may allow for meat to seep through. Don’t let the 304-grade stainless-steel construction fool you, the actual finish of this stuffer is not of the highest standard. Made in China, it costs less, but isn’t a patch on American-made brands, like the LEM, but there are no huge issues. We hope we have demystified some of the art of sausage making for you. The best sausage stuffers can save you money, time, and effort, while producing healthier, fresher sausages for you and your family. Electric stuffers may seem to be the best option, but they can be harder to master, more expensive, and there’s more to go wrong with them. For beginners, a simple manual machine can be much cheaper, easier to use, and still produce enough sausages to satisfy even the biggest family. Always try to choose the most durable machine you can afford, for years of uninterrupted sausage making. If you do upgrade to an electric machine, you can pass your older machine on to friends who will be eager to try, especially after tasting your efforts. If you have any questions, comments, or even funny stories involving sausage stuffers, please leave a comment below. We are sizzling with anticipation!